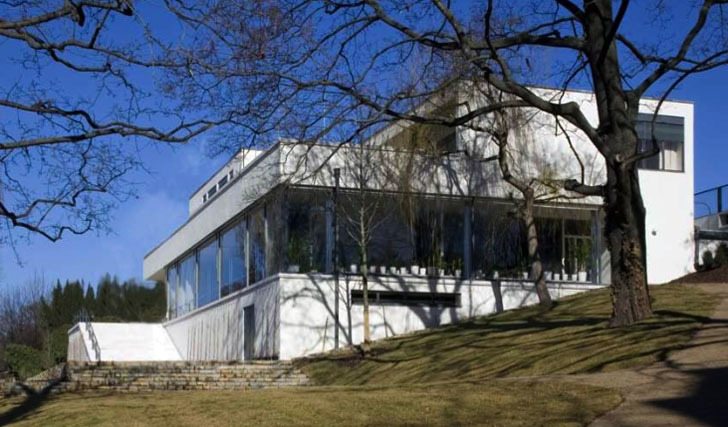 Lovers of modern architecture rejoice: a two-year reconstruction of architect Ludwig Mies van der Rohe's iconic Villa Tugendhat in Brno, Czech Republic was recently completed - and it looks spectacular. The modern masterpiece is one of the most famous houses in the Czech Republic, and after a restoration and reconstruction project that included everything from the structure of the building down to the door hinges and furniture, the historic home has been reopened and is ready for its close-up. The three-story, single-family home was built on a hillside in Brno in 1930 for a Jewish family, and it was seized in 1939 by the Gestapo and later used as an office and apartment building. Since 1994, the home has been operated as a museum, and finally in 2001 it was designated a UNESCO World Heritage site (the only example of modern architecture in the Czech Republic to achieve that designation). Like many of Mies’ other homes, Villa Tugendhat features an open floor plan that has a light, airy feel with large windows that open up to the hill below. Inside, a grand flowing living area features a seating area in front of the onyx wall and a dining room that features a dramatic half-cylinder wall of Makassar ebony. The round Makassar wall disappeared from the home in 1940, and was considered lost until art historian Miroslav Ambroz discovered it at a university canteen in Brno in 2010, right around the time that renovations began. The panels were removed from the university, restored, and returned to Villa Tugendhat in 2011. For the reconstruction, AMOS Design sought out original materials, like wood panels, plywood, and veneers, and made historically accurate replicas of other components, like locks and hinges. Furniture upholstery was renovated where possible, but some replicas had to be made individually. The home is now open to the public. 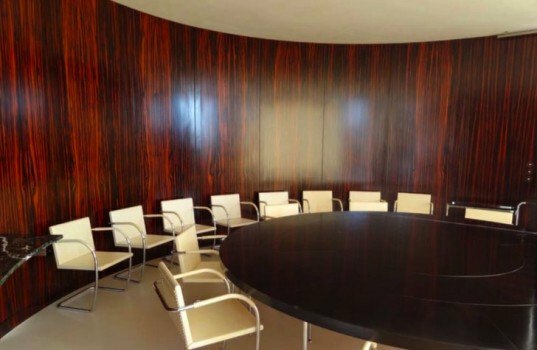 The entrance hall of Villa Tugendhat features a fully restored rosewood wall. Greta Tugendhat's room in the restored Villa Tugendhat features original and replicas of Mies' modernist furniture. Built-in furniture in the governess' room was restored using zebrano and maple veneers and opaxit glass. The terrace on one of the upper floors features a curved seating area that looks down on the hillside below. The living room features a large, open floor plan and a curved wall from the dining room. The round Makassar wall disappeared from the home in 1940, and was considered lost until art historian Miroslav Ambroz discovered it at a university canteen in Brno in 2010, right around the time that renovations began. The living room features colorful Barcelona and Tugendhat chairs. An onyx wall and buffet serve as room dividers in the sprawling living room. The library features a built-in banquette and book shelves with a macassar veneer. The three-story, single-family home was built on a hillside in Brno in 1930 for a Jewish family, and it was seized in 1939 by the Gestapo and later used as an office and apartment building. The modern masterpiece is one of the most famous houses in the Czech Republic, and after a restoration and reconstruction project that included everything from the structure of the building to the furniture was restored, and now the historic home has been reopened and is ready for its closeup. For the reconstruction, Amos Design sought out original materials, like wood panels, plywood and veneers, and made historically-accurate replicas of other components, like locks and hinges. Furniture upholstery was renovated where possible, but some replicas had to be made individually. The home is now open to the public.